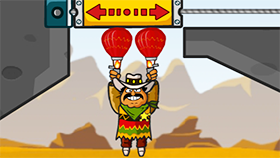 Amigo Pancho is a puzzle game developed by Yury Koshechkin. The game creates a close intimacy with the cartoon graphics that will make the player feel like the graphic style of Disney cartoons. In Amigo Pancho, you will have to save Pancho from the scary desert with cacti that have life and act like humans. The game's gameplay is very interesting, at each stage you will have a different layout available and you will use the mouse to click on the projects so they disappear, thus creating the next scenario to destroy the other. Obstruct or create a way to Pancho out of the desert. Pancho himself will be holding two balloons in both hands. But there are always obstacles above the balloons and your task is to clear the obstacles to help the balloons fly up and pull Pancho safely. There will be projects you can not make them disappear like rocks, cages, cactuses, etc. Most of them can only disappear from the wooden projects. The interesting part of the game is that there will always be cactuses and you have to deal with them wisely, because if they touch the balloons, it will break the ball. In addition, the obstacle system in the game is very rich not to boring players, in addition to the cactus, you will face the cactus shoot continuous guns, spikes, iron bats. The game has a total of 25 stages divided into three easy sections from level 1 to level 7, medium from level 8 to level 18 and hard from level 19 to level 25. Each stage starts at 1000 and the number is reduced. Gradually until you complete the stage. At this point, the rest of the score is the number of points you gain from the stage, try to finish the stage as quickly as possible. The game also includes mobile versions for Android and iOS players via download on Google Play and Appstore.